Grizzly woodworking tools, including the new 12” disc sander, are being added to ToolSelect rapidly, where the site’s members review and discuss all brands and types of tools for woodworking. Grizzly woodworking tools continue to make an impression on the ToolSelect community with the release of their new 12” disc sander, giving ToolSelect’s members another tool to review and discuss. Grizzly designed the disc sander for bench-top use, incorporating its own dust-collection system that includes a 2 ½” dust port, dust-collection fan and bag. Grizzly notes the disc sander runs on a 1/3 HP, 120 V, single-phase motor with direct power-drive transfer and features a 12” cast aluminum disc that accepts all 12” PSA sanding discs. A cast aluminum table tilts from 0 to 45 degrees with a miter gauge for compound angles. The tool comes with a one-year warranty. ToolSelect is an unbiased community powered by its members that covers all aspects, types and brands of tools, but does not actually sell any tools. 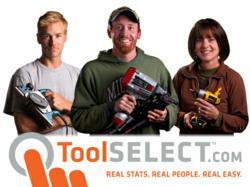 ToolSelect’s members include everyone from experienced tradesmen to complete novices. Users trade tips, compare notes, debate their favorite tools and work together to help each other make intelligent purchasing decisions.